Can over washing your hair, or not washing hair at all, actually cause hair loss? Poor hair hygiene might well cause changes in your scalp sebum levels over time. So, does shampoo simply keep hair clean? Or can using it too much or too little affect hair health? The two theories below explain how hair growth and hair loss might be influenced by the shampoo-sebum balancing act at the two extremes of the hair hygiene spectrum: washing hair everyday, and not washing hair at all. This theory focuses on the overproduction of sebum. Sebum is an oily substance produced and secreted by a sebaceous gland in each hair follicle. And the amount of sebum produced is governed by dihydrotestosterone (DHT). This powerful male hormone is the reason why sebum production increases during puberty, often causing greasy skin and spots to appear on teenage faces. So, if the sebaceous glands in your scalp follicles are producing too much sebum, and you're not washing your hair frequently enough to remove it, how might this be detrimental to the health of your hair? Can excessive sebum levels actually cause hair loss? 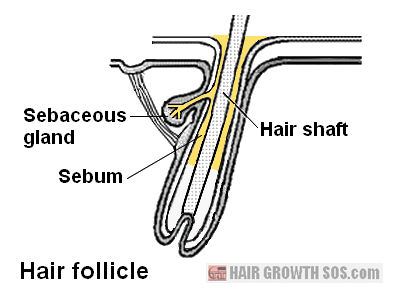 From the diagram below, it's easy to see how sebum could easily ooze down to the bottom of the hair follicles and fill them with oil. So, if your hair washing regime isn't very frequent (e.g., you don't shampoo at least every one or two days), it's possible that this sebum might start to harden into a waxy plug and obstruct the hair shaft as it tries to grow along the follicle. Also, if the hair root (dermal papilla) gets clogged up, hair production can start to choke, causing growth to slow down or even stop completely if the follicle becomes totally blocked. However, there are plenty of people who don't shampoo that regularly but still grow hair without any problems at all. So, whilst some people claim that an extremely high level of hygiene is needed to maintain normal hair growth, this is simply not true. Having said that, if your hair does get very greasy, it’s probably a good idea to wash your hair quite often because it might just be possible that high levels of sebum could contribute to hair loss in some way. And, at the very least, you won't have permanently dirty hair! So that explains poor hair hygiene, what about over washing your hair? Hair regeneration takes place through the hair growth cycle. This involves a growing phase (which usually lasts about five years), a breakdown phase (about two weeks) and a resting phase (three to four months) before the cycle restarts. And stem cells are vital if this ongoing process is to continue. In the diagram below, notice the bulge area. This is where stem cells are produced. And these stem cells must migrate down from here to the dermal papilla for the next hair growth cycle to be successful (see red arrow). 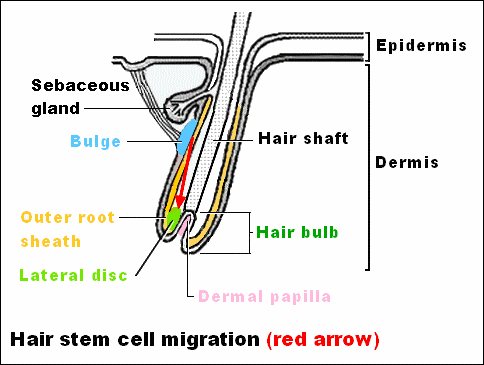 How then, do the stem cells get down from the bulge area to the dermal papilla? In the diagram, you can see that the sebaceous gland lies immediately above the bulge. So, does sebum from the sebaceous gland help stem cells migrate down to the dermal papilla? It does sound a bit unlikely that stem cells could somehow "piggyback" ride the sebum like this as it flows down to the dermal papilla. But sebaceous glands are present in all types of hair we have (eyebrows, body hair, pubic hair, etc). And the position of the sebaceous gland just above the bulge also suggests that there might be a higher purpose to sebum in the role that it plays. If so, then perhaps washing your hair too often might remove an excessive amount of sebum from the hair follicles, which then becomes detrimental to the next hair growth cycle. If, say, you use a strong* shampoo every single day, perhaps in time, such over washing might prevent your hair follicles growing healthily in subsequent hair growth cycles. And if your hair follicles are weak, so too will be the hair that they grow. * Note: Many shampoos contain ingredients considered by many to be potentially dangerous, albeit in relatively small amounts. 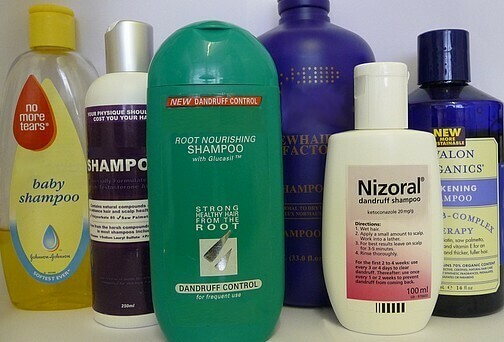 Learn about these shampoo ingredients? Can You Wash Away Your Hair? Some people think that washing hair too much might be causing their hair loss. This belief probably stems from the fact that hair loss is often most noticeable during the hair washing process (hair in the basin, clogging up the plughole, etc). And because they notice this, they assume that it's the shampoo or hair wash process itself that is somehow to blame. However, only weak hair that's ready to fall out anyway will do so. When hair is wet and then given a thorough clean, there’s bound to be more hair lost than during the rest of the day. Sebaceous glands and the sebum they produce are designed to help hair, not hinder it. Sebum will coat and condition the hair shaft (allowing it smooth passage as it grows along the follicle) and also provide it with a degree of waterproofing. Clearly though, it is important to get the balance right - wash your hair too much or too little and you might end up harming your hair. Whatever conclusions you might draw from the two hair hygiene theories, you should probably take into consideration the current state of your hair before deciding whether or not to adjust the frequency with which you wash your hair. "I purchased your ebook about a year back and (thanks to your exercises) have since stopped having hair loss. I have grown a little hair back in the balding regions (frontal area), and the thickness of my hair overall is much improved, thanks to your advice."